Detection of environmentally significant contaminants in very complex mixtures is a challenging problem for analytical chemists. A common approach uses gas chromatography (GC) to separate the mixture components in combination with mass spectrometry (MS) to identify the separated components. However, some samples require more powerful separation methods. 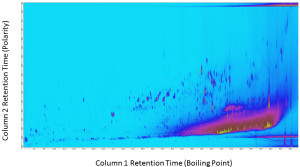 Comprehensive two-dimensional gas chromatography (GCxGC) combines two GC columns that separate compounds by different properties, such as boiling point and polarity. A computer program then creates a two-dimensional map of the components with the x-axis corresponding to boiling point and the y-axis corresponding to polarity. Each separated component appears as a spot or “blob” on the 2D chromatogram. GCxGC is generally combined with a time-of-flight mass spectrometer (TOFMS) that can acquire data very quickly. 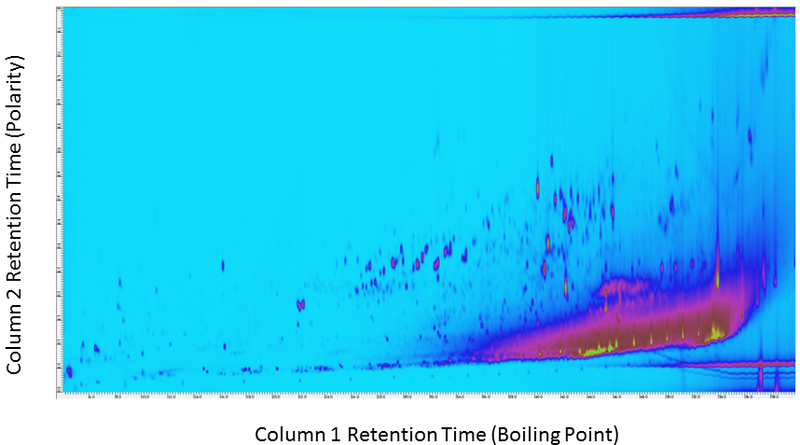 Most GCxGC/MS systems use low-resolution mass spectrometers that measure integer masses, but for our work, we used a high-resolution TOFMS system that measures the masses of compounds with an accuracy up to four decimal places. Because the combination of GCxGC with high-resolution mass spectrometry produces a LOT of information, we developed new software tools for processing and interpreting the data. The GCxGC chromatogram shown in Figure 1 shows the analysis of just such a complex mixture — a dust sample from an electronics recycling facility. To identify families of contaminants that contain different numbers of chlorines and bromines, we borrowed a trick from the petroleum chemists. Petroleum contains families of compounds that differ by the number and length of hydrocarbon chains, in other words, the number of methylenes (CH2). If you multiply the measured exact mass by a factor equal to the integer mass of CH2 divided by the exact mass of CH2 (14.00000/14.01565), then all of the members of a compound class will have the same exact fractional masses. This is called the Kendrick mass defect (KMD). The same trick can be used to find families of environmental contaminants like polychlorinated biphenyls (PCB’s) or polybrominated diphenyl ethers (PBDE’s). In that case, we just multiply the measured exact mass by a simple factor that will cause all members of a compound class with a different number of chlorine or bromine substitutions to have the same fractional mass. For example, all PCB’s will have a fractional mass (KMD) of 0.2551 and all PBDE’s will have a fractional mass of 0.2685. Plotting the Kendrick mass defect on the y-axis against the measured mass on the x-axis will cause all of the members of a compound class to fall along a straight line (Figure 2a) on the y-axis. The new software then allows us to find these compounds on the GCxGC chromatogram and identify them from their high-resolution mass spectra. Figure 2 shows the locations of PCBs (Fig. 2b) and PBDE’s (Fig. 2c) on the original GCxGC chromatogram from Figure 1. A measured mass spectrum and a comparison mass spectrum from a standard database are also included to show how we can identify the specific compounds in each group. Fig. 2. (a) Kendrick mass defect plot for all of the compounds in the dust sample and the locations of the (b) PCB’s and (c) PBDE’s on the GCxGC chromatogram together with an example of the measured and standard mass spectra for one compound in each class. The combination of GCxGC with high-resolution mass spectrometry and new software methods will make it easier to detect and identify families of compounds (for example, halogenated environmental contaminants) in complex mixtures. Non-targeted analysis of electronics waste by comprehensive two-dimensional gas chromatography combined with high-resolution mass spectrometry: Using accurate mass information and mass defect analysis to explore the data.